Robert Powoski, BS Chemistry & Secondary Education, 2008, is currently employed as an analytical chemist as a large aerospace systems company. 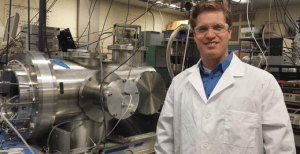 In this recent photo he is shown with the same chirped-pulse Fourier transform microwave spectrometer that he used in his Master’s thesis research. I enrolled at Monmouth University in Fall 2003 with my major undeclared, but leaning toward Criminal Justice with a concentration in Forensics. Ultimately, I graduated in January 2008 having majored in Chemistry and Secondary Education. I knew that I loved science and its resources to solve problems. I also knew that I loved to learn and share my love of learning. With advice from my academic advisor, I enrolled in General Chemistry and Introduction to Criminal Justice knowing that they were prerequisites for the many sequential courses within the forensic concentration. The lab instructor of my general chemistry night lab was Dr. Topper, Chair of what was at the time called the Department of Chemistry, Medical Technology, and Physics. I had a positive experience in this lab. Through his guided inquiry-based instructional approach, he developed an initial foundation for critical thinking in me by using a process-oriented chemistry perspective. That year, I attended my first career fair while looking for majors that could best transform this love for science and solving problems into a career. I found my professor, Dr. Topper, at the chemistry table and he listened to what my career interests were. He was able to provide informative reasons for why chemistry provided career paths to everything I was describing. His reasoning made sense and so I declared a major in Chemistry and Secondary Education. I am glad I did. 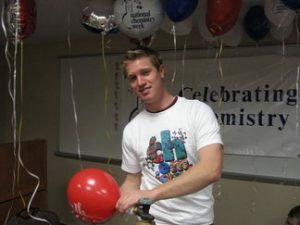 Robert in 2006 raising awareness of National Chemistry Week with the Chemistry Club. In my experience, the School of Science and the School of Education faculty were supportive in helping their students achieve success. The Schools provided experiential and educational opportunities, and the professors were approachable during, and often outside of, office hours. There was also the benefit of small student-to-professor class ratios. While at Monmouth, I was involved in extra-curricular activities such as the Chemistry Club. Our goal was to help spread chemistry awareness and to provide peer tutoring for general chemistry. I was a lab assistant for both organic chemistry and general chemistry labs. These experiences helped reinforce what I had been learning in the classroom. The education classes, such as Dr. Bazler’s Foundations of Teaching Science I and II, also provided a reinforcement of the chemistry content. In these classes, I was required to consider multiple levels of intellect in my audience when explaining chemistry content during my junior and senior teaching practicum assignments. MU’s Experiential Education requirement was fulfilled through my student teaching. However, I had a strong desire to obtain chemistry research experience and I was fortunate to be accepted into the NSF-REU program at the University of North Texas during the summer before my senior year, working under the advisement of Dr. Stephen Cooke. This valuable internship introduced me to gas-phase, high-resolution microwave spectroscopy. I used the chemical and spectroscopic techniques learned and applied them to heavy metal oxides; this research resulted in 3 co-authored, peer-reviewed journal publications. I learned so much about instrumentation, electrical components, molecular chemistry and electronic structural chemistry that summer. Many of my chemistry courses were useful for this internship experience, such as Quantitative Analysis lab under Dr. Kucharczyk, Molecular Modeling under Dr. Topper, and Instrumental Analysis lecture and lab under Dr. Tongesayi. Instrumental Analysis was my favorite course and introduced me to the power of analytical instrumentation in applied science and method development, and in solving chemistry problems. These courses, in addition to the Chemistry Seminar and Chemical Literature courses, provided me with valuable skills and resources on how to find a career job after graduating. After graduation from MU I worked as a chemist in three companies, all in different industries, and at one University. Initially, I worked as a quality control chemist at Church and Dwight Inc., a pharmaceutical consumer product company. At Church and Dwight Inc. I gained valuable analytical instrumentation experience in a FDA-regulated environment. Due to my positive experience at the NSF-REU program I chose to attend graduate school at the University of North Texas (UNT) to earn my MS degree in analytical chemistry. I wrote my thesis on the topic of molecular structural analyses of acyl chloride hydrocarbon molecules and their fluorinated counterparts using Chirped-pulse Fourier transform microwave (CP-FTMW) spectroscopy. My time in graduate school yielded 6 additional peer-reviewed journal publications. I was able to work my way through graduate school as an undergraduate chemistry lab teaching assistant, general chemistry recitation instructor, department tutor, and graduate research assistant. All of these positions provided valuable college chemistry and teaching experiences. I landed a job as a chemist for a Microbial Enhanced Oil Recovery (MEOR) start-up company in Texas after graduate school. I worked together with a talented team of microbiologists, geologists, and engineers, which provided rare learning experiences on how a company works together from all levels. In this position I worked in a chemistry lab where we provided support, quality control, and research and development for crude oil and production water-related samples for oil company clients. My knowledge of applied analytical instrumentation, preventative maintenance, troubleshooting, method development, geology, and microbiology greatly increased. It also expanded on my chemistry foundation built at MU and UNT. My most recent endeavor relocated me back to the East Coast for an analytical chemist contract position at a large Aerospace Systems company. This is an exciting new industry to work in, in that it involves my past analytical instrumentation support experience as well as my past science writing experience. The space systems research here challenges me to solve problems related to multiple aerospace environments utilizing the chemistry resources available. Some of the most influential career experiences for me were definitely the NSF-REU internship and teaching practicum. I highly recommend that students take advantage of independent research and innovative experiential education opportunities while at Monmouth. I would even suggest trying more than one. Ultimately, choosing chemistry has opened the door to many career paths. I am pleased with my decision to begin my chemistry career at Monmouth and I look forward to developing and sharing my skills for years to come.